Previous “Actively appreciating” chips, dip & life in general. Next Guest Post on A Hopeful Sign: How Mama Got Her Happy Groove Back. 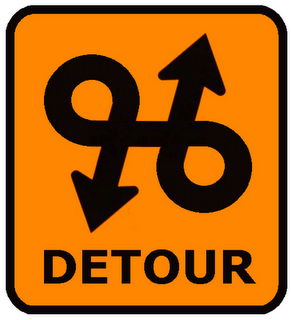 Detours create some of the most interesting journeys. Pretty sure we met while I was on a big detour. Tara, so many people in a rush to get to places with no patience…always nice to help someone else out and I bet you smiled about that the rest of the day! It reminds me of a friends story he was in a different state lost, a man stopped to help it started pouring so the man sat in my friends car with his map giving directions , the man left his keys in the car, my friend drove an hour when he realized the huge ring of keys he drove all the way back but the guys car was gone. He took them to the police they were able to track him down and return the keys. When someone shows you a kindness you want to give it back! as always enjoyed your cranky crusher! That’s the great thing about detours…without a few of them in life who knows what might be missed…and who’s to say that regular detours may not become simply part of ones path!